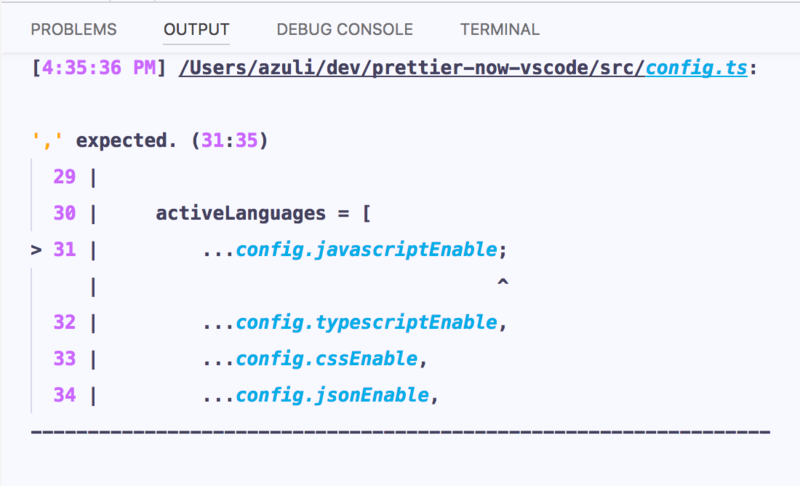 Visual Studio Code>Formatters>Prettier NowNew to Visual Studio Code? Get it now. This extension is a wrapper around Prettier Miscellaneous, please report issues regarding the output on Prettier Now or Prettier Miscellaneous. Added support for GraphQL and CSS files with PostCSS syntax. New options jsxSingleQuote, spaceBeforeParen, alignObjectProperties. breakBeforeElse should now break properly. Added support for TypeScript, CSS, LESS and SASS files. Prettier takes your code and reprints it from scratch by taking into account the line length. Prettier enforces a consistent code style (i.e. code formatting that won't affect the AST) across your entire codebase because it disregards the original styling by parsing it away and re-printing the parsed AST with its own rules that take the maximum line length into account, wrapping code when necessary. Install through VS Code extensions. Search for Prettier Now. Set editor.formatOnSave to true in settings to automatically format files on save. If you are using the Prettier output option, it is recommanded to use the Output Colorizer extension to get some syntactic coloring in the logs. singleQuote If true, will use single instead of double quotes. • Quotes in JSX will always be double and ignore this setting. trailingComma Controls the printing of trailing commas wherever possible. all - Trailing commas wherever possible (function arguments) "none"
bracketSpacing Print spaces between brackets in array literals. semi Print semicolons at the ends of statements. true - Add a semicolon at the end of every statement. typescriptEnable Will apply Prettier Misc using TypeScript parser. cssEnable Will apply Prettier Misc using PostCSS parser. jsonEnable Will apply Prettier Misc using JSON parser. graphqlEnable Will apply Prettier Misc using GraphQL parser. Prettier JSON parser doesn't tolerate comments as they're not part of JSON spec. It is cumbersome since it will trigger an error on document save and more and more projects make use of comments in JSON files (included VSCode configuration files). This will get fixed in upcoming versions of Prettier (see this issue). Feel free to open issue or PRs Here!